The rapid growth of marine macroalgal cultivation amplifies the potential impacts of seaweed diseases. Here, we combine microscopy and molecular analysis to describe two novel European species, Olpidiopsis palmariae and O. muelleri spp. nov., that infect the commercially important red algae Palmaria and Porphyra, respectively. A Scottish variety of Olpidiopsis porphyrae, a devastating pathogen of Pyropia previously thought to be restricted to Japanese seaweed farms, is also described as O. porphyrae var. scotiae. 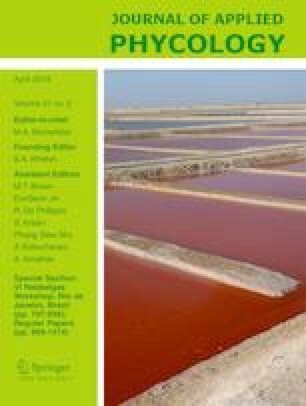 In the light of their destructiveness in Asian farms, together with the global expansion of algal cultivation and pertaining seed trade, Olpidiopsis pathogens should be treated as a serious threat to the sustainability of red algal aquaculture. Our findings call for the documentation of seaweed pathogens and the creation of an international biosecurity framework to limit their spread. The online version of this article ( https://doi.org/10.1007/s10811-018-1641-9) contains supplementary material, which is available to authorized users. CMMG, GHK, YB and TAK designed the experiments; CMMG and GHK supervised the research; YB, CMMG, GHK and JCS conducted the fieldwork; YB, TAK, MS, AG and PM conducted the laboratory work YB and CMMG wrote the manuscript with contributions from all co- authors. All authors gave final approval for publication. This work was financially supported by the UK NERC IOF Pump-priming + scheme (NE/L013223/1 – Y.B./C.M.M.G. ), the European Union’s Horizon 2020 research and innovation (ALFF No 642575 – A.G./C.M.M.G; EMBRIC No 654008 – C.M.M.G. ), the Genomia fund (HERDIR – M.S), and a MASTS Visiting Fellowship Scheme (J.C.S.). P.M. was funded by Conicyt (BecasChile No. 72130422) for PhD studies at the University of Aberdeen, and by the NERCIOF Pump-priming (scheme NE/L013223/1) for activities at the Scottish Association for Marine Sciences. This work was partially supported by a National Research Foundation of Korea Grant (NRF-2015M1A5A1041804) funded to G.H.K. We are also grateful Duncan Smallman and Philip Kerrison for providing Palmaria specimens.